Hi and welcome to our website Cat Habits! We are two cat lovers living in Norway with our cats. 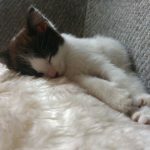 Cat Habits grew from a personal blog towards a place where we try to inform and teach current and future cat owners about cats. On this website we tell you about our adventures and experiences with our dear fellow family members. The question remains whether we are the cat owners or whether the cats are owning us! 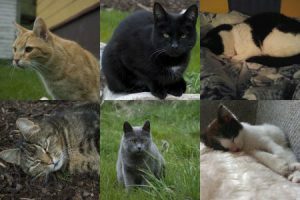 As of right now we got five cats of our own and we got anywhere between 1 and 3 more cats living with us from the RSPCA. 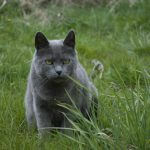 We work together with the local RSPCA services (Dyrebeskyttelsen), saving and capturing cats that are in danger. Steven is interested in nature, animals, cross-country skiing, computers and marketing. He studied Computer Technology and also has a Bachelor in Marketing. 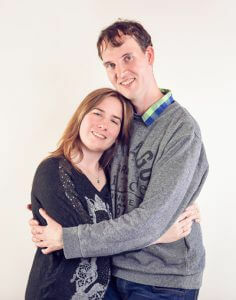 Steven works daily with online marketing and writes content for websites. Steven felt that so many people were misinformed about cats. People generally didn’t know really how to take care of them or treat them. From simple things such as lifting a cat up, to feeding them or when to take them to the vet. That’s why he started writing blogs for Cat Habits to make sure that people are better informed and can find answers on their questions about cats. Cat Habits became a business with a mission to keep cats thriving happy and healthy. Theresa is very creative. She loves to draw, she plays guitar and sings her own songs. She has also become an author writing her own books in the science fiction genre. When weather allows it, she loves to go for a nice walk in the beautiful nature she lives among, preferably together with her cats. She loves her cats more than anything (more than Steven?) and spends a lot of time saving all sorts of animals for the RSPCA. Theresa has finished an education in Media and Computers. 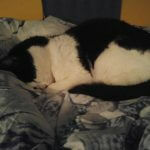 Next to writing sometimes for this blog, she is the driver behind the Cat Habits Twitter and Cat Habits Facebook Page. Every day she tries to post something nice to share with these two big communities. She’s also Steven’s big support in keep on pushing Cat Habits forward and further developing different aspects of Cat Habits. In her spare time she does gaming on consoles and PC. The cats join her in most of her activities. Below follows a short presentation of each of our cats. You can click the link below them to read more about each cat. Felicia came to us October 2015 and was a total feral cat, found at a fuel station near the motorway. She was most likely dumped with a lot of other kittens together, by people that didn’t want to have kittens. She came to us as a project kitty for the local RSPCA, but a year or so later we decided to adopt her into our own cat family. After a bit over a year, she started to open up and became one of the most cuddly cats around. Nowadays she will even sit on your lap and really do things that you wouldn’t expect from a feral cat! In 2008 we took over two cats that were forgotten about in a divorce drama, their names are Nusse and Kira. They were thought to be sisters, so the RSPCA didn’t want to split them. After taking care for them for a while, we decided we wanted to adopt both cats together. Kira loves high places and sometimes acts like a dog, showing her belly and rolling over. Nusse was a proper boot of a cat. We say that because we love her of course, but she had a typical bad girl behaviour. She had health troubles her entire stay with us and unfortunately passed away in 2016 due to kidney failure. She was a lovely cat that became more and more cuddly. We think that the extreme cuddly behaviour came from the illness, but even before the illness she loved to sit on your lap. After Nusse’s passing in December 2016, it took nearly 6 months to be reunited with her again. Here you see a picture of her when she was just 10 weeks old. 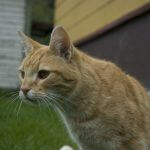 Kitten Nusse (by now over a year old) had many of the same characteristics of the old Nusse. She even shows the “boot” behaviour towards other cats. Extremely cuddly she is as well and she communicates a lot of with us. We packed the story of Nusse and Kitten Nusse in one and the same read more page below. One day in 2006 a kitten came to our neighbourhood. When no owner showed up after a long session of hanging out banners with phone numbers, Steven decided to take this cat in as his own. We named him Tabby. Tabby loves to be outside, so there he is to be found more often than not. All summer he is more out than inside, while in Winter he might be more inside than out. He usually comes around morning or evening inside to eat and than leaves again. Tabby is an extremely cuddly cat when he wants to be. He can easily get a tad bit too excited, resulting in a sudden warning or request for more. Never quite sure, but it doesn’t hurt. It is just a bit unpredictable, so that’s why we warn our visitors for it beforehand. He is a proper wild cat and hence lives much in nature. Tiger is a male cat that Theresa saved from being killed in 2003. When people don’t want cats in Norway they either take them to the veterinary to be killed or shoot them with their own gun. It is sad that this is common behaviour, but RSPCA is trying to fight these old traditions. Tiger is a super cuddly cat, but also has these unpredictable warnings. His warnings are a little more predictable, as long as you are able to read his body language. 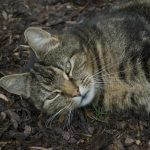 Most of our visitors are unable to read body language of a cat and so they get a slash out from him (it doesn’t happen to us, because we know him very well). He is a proper boy that ends up in fights with other cats and from time to time gets stressed up by this. Tiger has learned from us humans how to hug. He will hug and kiss you. Unfortunately he has a marking issue. He refuses to use the cat litter box in most cases, so he will do his business outside. Thanks to the cat flap this is a possibility. In Winter we do try to keep him in a bit more than in Summer, because of the extremely low temperatures here in Norway. Cats should not stay outside in extreme cold. The other solutions we have found for him is installing heated outdoor cat shelters for him and Tabby.